As businesses continue to integrate social media and become more confident and comfortable with social media tools and platforms, we’re starting to see a change in social media usage. A new study reveals what’s changing with social media. SmartBrief recently partnered with Summus Limited to survey more than 6,000 of its readers across a variety of industries. They benchmarked and measured the state of social media usage among businesspeople. The data identified eight prevalent trends that give great insight into the social media behaviors, beliefs and challenges of the majority of businesses today. 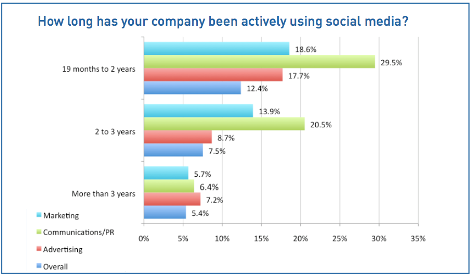 Most companies (66.5%) have adopted social media in the past 18 months. About half of the companies reported they’ve only been using social media for about a year and about 20% reported they’ve adopted social media practices in the past 13 to 18 months. The graph above is a great reminder that most businesses are still very new to the social media arena. Companies are focusing their energies on Facebook, Twitter, LinkedIn, YouTube and blogs. Data suggests that companies focus their time and efforts on the “big 5” because they’re able to find their customers there. Unfortunately companies may be missing out on valuable niche groups by not extending their reach to the less-popular social sites. Flickr, for example, has a large audience even though it’s not as popular as Facebook or YouTube. Based on the graph above, Facebook is the leader in social media platforms; however, Twitter is close behind in the minds of business professionals. It takes time for companies to incorporate social media effectively. The data identified a 2-year mark where businesses begin to gain confidence in their social media activity. 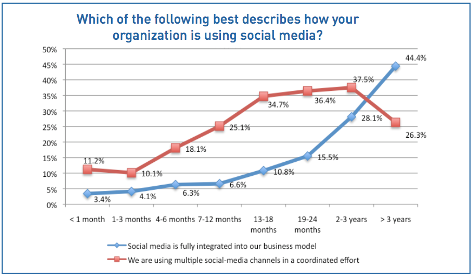 More than 25% of the companies using social media for 2 or more years say the tools and platforms have been fully integrated into their business model. In addition, more than 50% say they have a well-developed or fully developed social media strategy. Note the 2-year mark in the graph above. This is where the majority of companies start feeling more confident in their social media strategies. Brand-building is currently the primary purpose for business social media usage. However, the research showed that most companies are using social media to broadcast information versus using it for two-way communication. This is unfortunate. Many companies are missing the opportunity to build stronger relationships by listening to their clients or customers, instead of doing all the talking. 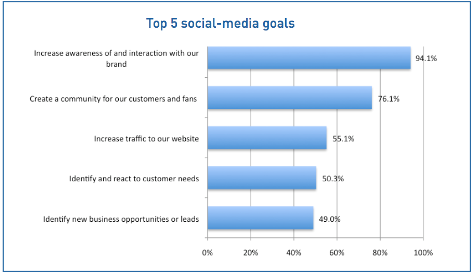 As indicated in the chart above, the most popular social media goal among the respondents was to "increase awareness and interaction with our brand." Unfortunately, most companies still continue to broadcast messages more than they use social media tools to engage and connect with their customers and prospects. Perhaps this will begin to shift as companies become more confident in their social media activity. Communications, advertising and marketing agencies are the leading adopters of social media. However, an interesting finding of the study showed that agencies are not the preferred source for social media support. 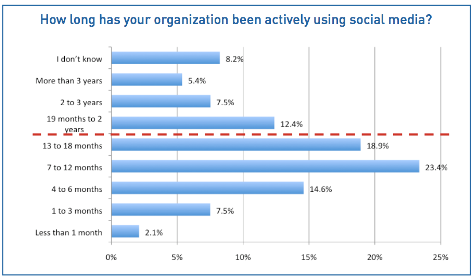 Most of the companies surveyed have opted to create and execute their social media strategy using internal resources. The marketing, communications and advertising agencies were the clear early adopters of social media, but businesses have been reluctant to turn to these agencies for social media support. The resistance to look to an agency for support may be a partial reason for the 2-year "ramp-up period" highlighted in the chart above. Perhaps the learning curve could be shortened if companies looked to the experts and early adopters for support as they build their overall strategy. 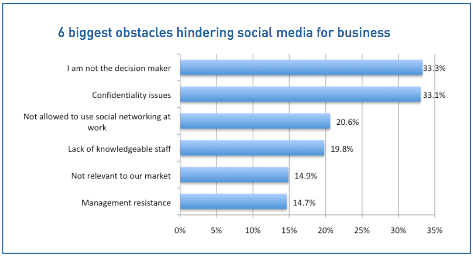 Lack of management support and conﬁdentiality concerns top the list of obstacles to social media adoption. There was a clear lack of management support for those companies who have not yet adopted social media. 33% of the respondents pointed out they weren’t the decision-makers and 14.7% stated “management resistance” as an obstacle to social media adoption. To add to this, 33.1% pointed to “confidentially issues” as a reason for not adopting social media. As we’ve seen in numerous studies this last year, companies are still struggling with employee social media usage and how to manage it internally. In this chart, it's interesting how 33.3% of the respondents saw their lack of decision-making ability as an obstacle for social media integration in their business. Likely, the majority of the people responsible for social media management are not in a traditional management role. 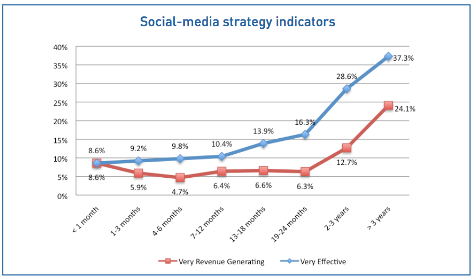 Less than 15% of the businesses using social media are measuring return on investment. Over 33% are not measuring return on investment at all. It seems that many businesses struggle with identifying what to measure, how to measure and how to interpret the data when they are able to gather results. Among those businesses that are measuring their social media activity, the focus is on usage and incoming traffic. Interestingly, most are not using traditional business metrics. 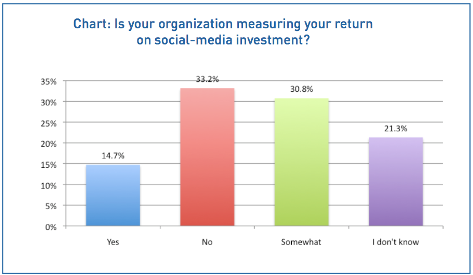 As this chart shows, only 14.7% of respondents answered "yes" to the question "Is your organization measuring your return on social media investment?" This shows that businesses know they should be using social media, but they don't necessarily understand why. While 60% of respondents say their companies are using social media, there’s low confidence in their social media strategies. 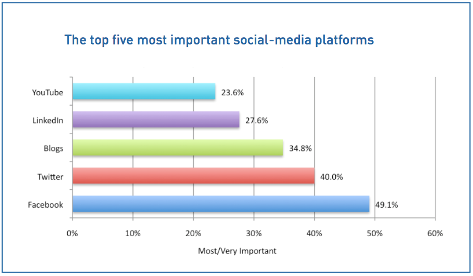 One of the most interesting findings in this report was how the respondents rated their social media strategies. Only 14.2% described their strategies as “very effective,” while a low 7.3% described them as “very revenue generating” on average. Based on this graph, it's clear that most of the companies surveyed didn't have confidence in their social media strategy. Based on the fact that most companies are not tracking their success (as seen above) and most are trying to build their social media strategy internally, it makes sense that most are lacking confidence in their overall success in the first few years. The full “State of Social Media for Business 2010” is available here from SmartBrief. Now it’s your turn. Where does your company stand versus the social media benchmarks mentioned above? Are you confident in your social media strategy? Share your experience and comments in the box below.